We met today in St Paul’s Cathedral in Dundee to remember John – just a few weeks after his untimely death. The atmosphere in the Cathedral said to me that John was one of those people who didn’t seek or solicit the affection of others – but affection and warmth gathered around him. Good liturgy – and the extraordinary music which Provost Jeremy Auld and Stuart Muir lead at St Paul’s. It’s bright, congregational and engaging – such that worship becomes a wonderful blend of words and music interwoven. I listened to the Intercessions – worked around words written at various times by John – and to Trevor Pitt’s excellent sermon – and to the tributes from our own Bishop Mark and Fay Lamont. I felt again what I realised at John’s funeral – that there were things that John had thought deeply about and cared passionately about and somehow we failed to benefit from them as we should have. I’m thinking in particular about his work on British Worker Priests and his passion about how the church should engage with the life of the city. 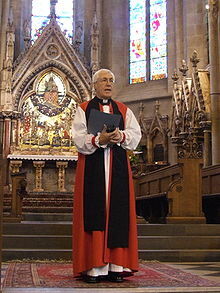 We shall miss him greatly – in the College of Bishops, in the diocese and across our church. He came back to the place in which he grew up and he gave us of his best. Thanks for leading us at +John’s Memorial Service in St Paul’s Cathedral. You have a lovely, precenting voice, by the way! The music excelled; the organisation was smooth and, to the congregation, without hitch; the Thurifer was manic ( aren’t they all?) yet he succeeded in helping create that essential Piskie atmosphere for our lovely Eucharist. The Orthodox chant of the Pater Noster was a brilliant idea. We learned things about +John we never knew. The words of those who spoke made us think about the achievements and gifts of +John. We met old friends from around the Province; we imbibed with wine and sandwiches etc. A wonderful and meaningful service. As a priest there said to me ” we have such a lovely Holy Liturgy; it’s important that we retain it for the future.” Agreed. Graham & Valerie Vahey, Glasgow.